We heard from Val yesterday that the Easter Cargo Bike Ride is on. Click the link for details. The route is South end friendly, it starts at the Delridge Playfield and ends at Seward Park. 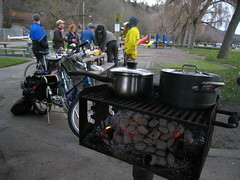 More is better..bring lots o’ food and drink and perhaps a camp stove to make hot beverages. But if you forget, there’s always plenty of food and drink and friendly folks to share it with you. Dress warm and prepare for rain, cause this is Seattle and it always rains on Easter. Bring something for the kids to do. There’s a playground at Seward park but it doesn’t hurt to throw in a soccer ball or a frisbee or fishing gear. Why not throw it all in, that’s why you ride a cargo bike, right? We have family obligations this weekend and won’t be able to make it. We’ll catch y’all next time. This entry was posted in bikes, cargo bikes, extravehicular activities and tagged Cargo bike ride, Easter, group rides, seattle. Bookmark the permalink. You teases! I was rearranging my weekend while reading your post so that I could come ride with you… and then…. nope! Psych! What Janet said – we’ll miss you, for sure. Sorry to tease, Janet. We’ll go on a cargo ride with you anytime, we’ll even carry all of the cargo. Just say when. Have a good ride, Val! We hope you are well.